In a cemetery on the southern outskirts of Paris lie the bodies of nearly a hundred of what some have called the first casualties of global climate change. They were the so-called abandoned victims of the worst natural disaster in French history, the devastating heat wave that struck in August 2003, leaving 15,000 dead. They died alone in Paris and its suburbs, and were then buried at public expense, their bodies unclaimed. They died, and to a great extent lived, unnoticed by their neighbors–their bodies undiscovered in some cases until weeks after their deaths. 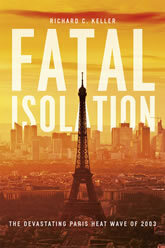 Fatal Isolation tells the stories of these victims and the catastrophe that took their lives. It explores the multiple narratives of disaster–the official story of the crisis and its aftermath, as presented by the media and the state; the life stories of the individual victims, which both illuminate and challenge the ways we typically perceive natural disasters; and the scientific understandings of disaster and its management. Fatal Isolation is both a social history of risk and vulnerability in the urban landscape and a story of how a city copes with emerging threats and sudden, dramatic change.